You should consider the Staybridge Suites if you want to stay in a homely suite located within walking distance of all Liverpool attractions. For the best room rates check the Staybridge Suites, Liverpool website and for the latest news check out the Twitter or Facebook feeds. 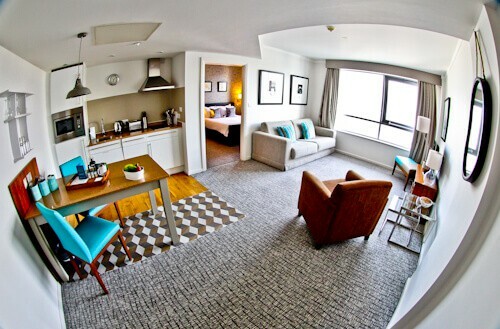 The Staybridge Suites, Liverpool is in the perfect location for visiting Liverpool. 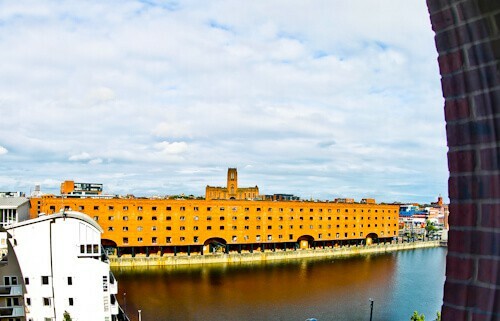 It’s located on King’s Dock opposite the Echo Arena, the BT Convention Centre and the Albert Dock. If you’re visiting for a convention or a concert / show, all you need to do is walk over the pedestrian zone (above). The Albert Dock is located at the other side of the Wheel of Liverpool (above). In between the Albert Dock and King’s Dock is where the Liverpool city tour buses leave from. You’ll find the city tour bus, the Beatles Magical Mystery Tour bus and the Anfield Stadium Tour bus in between the docks. It’s a 10 minute walk to the Liverpool One shopping district from the hotel. The check in desk is open 24 hours so whatever time you arrive, you’ll be welcomed. If you’re arriving in Liverpool before the official check in time and your room is available then you you’ll be welcome to check in early. There’s a 24 hour convenience store located at reception where you can purchase snacks and food to cook in your suite. Opposite the reception desk there is a unique John Lennon / Mona Lisa print (above left). Designed by Liverpool artist Alex Corina this piece of art is known as the Mona Lennon. Around reception you’ll find several pieces of Beatles memorabilia, you’ll know you are in the home city of The Beatles. There are also some photos of the points of interest of Liverpool displayed throughout the ground floor. These photos were taken by a former long term guest of the Staybridge Suites, Liverpool. If like me you are in Liverpool to photograph the points of interest of the city then you’ll gain great inspiration from viewing these photos. As a solo traveler my first choice of room is a studio suite which is also perfect for couples. In this suite you have a fully equipped kitchen with fridge, dishwasher, cooking hobs, microwave, toaster and cooking utensils. Whilst traveling it can be difficult to eat healthily because normally you eat out everyday. With your own personal kitchen you are able to eat healthier. The kitchen is perfect for those with restricted diets such as those on vegan, vegetarian or a gluten free diets. You won’t need to go searching Liverpool for vegan friendly restaurants or gluten free options. The one bedroom suite is perfect if you’re staying long term or with family / friends. Business travelers staying longer term will appreciate the space and the ability to keep your working area in a separate room to where you sleep. If you’re visiting with family then the sofa bed is huge and super comfortable so the family can stay together. Whilst traveling with kids it can be difficult eating out due to the kids restricted food choices. In this case the kitchen is perfect for preparing the food your kids are used to eating. One of the points of interest of Liverpool is the Liverpool Cathedral (above). Liverpool cathedral looks better from a distance than up close as you can see the facade. From the room you have one of the best views of the cathedral. I recommend whilst booking that you request a cathedral view room. An alternative view you may request is that of the Wheel of Liverpool and Albert Dock. 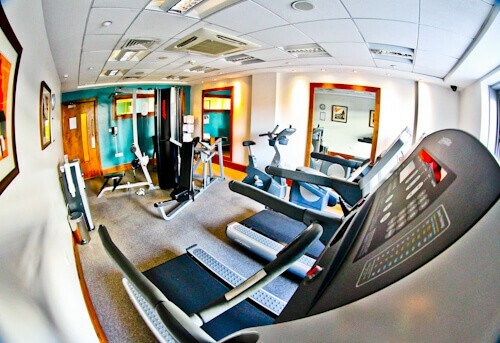 The fitness center is open 24 hours which is perfect if you arrive in Liverpool jet-lagged or are working unusual hours. Located next door to the fitness center are the guest self laundry facilities. The location of the laundry next to the gym is perfect because you can exercise whilst your clothes are being washed then exercise again when they are drying. Washing powder is on sale 24 hours at reception. The Den is a large private room which can host up to 20 people. If you are visiting on business and need to conduct a meeting, The Den is the perfect location to do this. 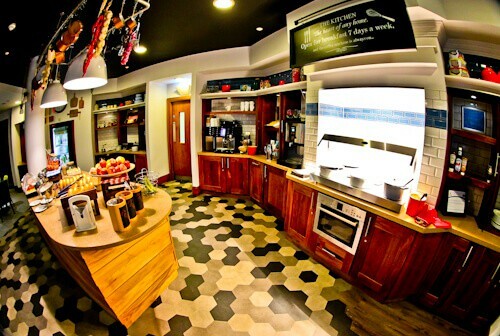 The Den is conveniently located on the ground floor, close to the 24 hour complimentary coffee machine. It’s possible to reserve a time in The Den so you can plan to hold a meeting there in advance. Breakfast buffet is served daily and it is a very homely buffet. You help yourself to breads, cereals and hot foods, there is a fridge where you can take your orange juice, apple juice or milk. The board in the buffet area reads ‘The Kitchen, the heart of any home’ which describes this buffet perfectly, you’ll feel like you’re eating breakfast at home. The coffee machine in the kitchen is turned on 24 hours a day and you are welcome to help yourself to as much coffee as you require. 3 nights a week the kitchen hosts a social night where all hotel guests are invited to enjoy complimentary snacks, wine, beer and soft drinks from 6-30 – 7-30 pm. For the best room rates, check the Staybridge Suites, Liverpool website. The longer you stay with Staybridge Suites, the less you pay, I’d recommend you email the hotel directly if you are planning an extended stay. For the latest news, check out the Twitter or Facebook feeds. 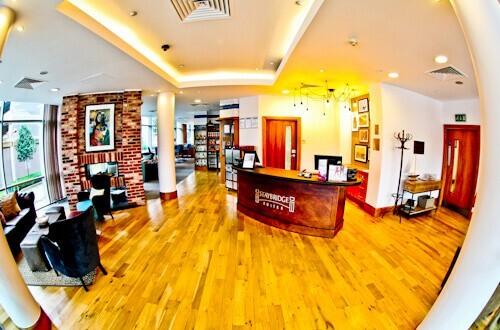 Enjoy your stay at Staybridge Suites, Liverpool. 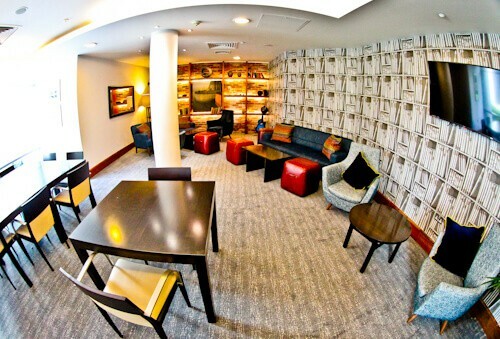 Check out the Staybridge Suites in Newcastle. The location of the property seems to be brilliant. I love the way it’s so quirky and colourful. Moreover, having a fully equipped kitchen makes life more comfortable, and helps save a little money as well. Cheers!! 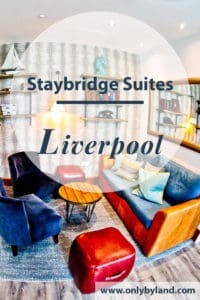 The Staybridge Suites sounds like a wonderful stay option in Liverpool! I will definitely look it up on my next trip there, as a huge Beatles fan Liverpool is on my radar. I love how the reception is always manned 24 hours a day, as there is nothing more annoying than turning up somewhere and not being able to check in! The hotel looks awesome inside, particularly the one bedroom suite!It looks soo homely! Great review! Staybridge Suites sound like a good choice for exploring the ‘Pool’! I was there a few years, and it’s become so developed. Good tip about the kitchen and being able to cook and eat healthier. I can’t remember what I ate in Liverpool, but I’m sure it wasn’t healthy! This really sounds like a great property to stay at with loads of extras. Free coffee and social nights…that’s definitely a plus. It all looks so fresh and bright and the rooms certainly do look spacious. Added to the central location, this place looks like an obvious choice for visits to Liverpool. Am definitely going to spend a few nights in Staybridge Suites in Liverpool. The whole place has got a very relaxed vibe, and the spacious rooms and the common area, just add on to the comfort. I love how the place has made it of use to all kind of travelers, be it business travelers, families etc. We always prefer staying in apartment style accommodation equipped with kitchens and Staybridge Suites sounds perfect. You are right when traveling with kids the apartments are great for we can prepare food for kids and save a bit on food for ourselves too by preparing food at the room. The suite being close to the Liverpool attractions would be a added bonus. I like that the Staybridge Suites are situated on the river – the Mersey always offers interesting eye candy. 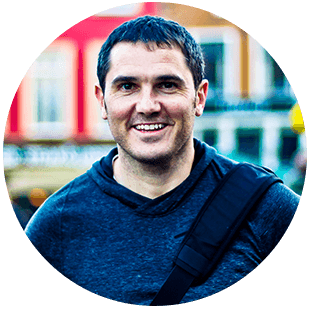 Nice fitness center too – I’ll keep this place in mind when visiting Liverpool, which I do, from time to time – nice review! You’re so right that it’s hard to eat healthy on the road! I also love cooking. Your pictures are so cool. Wide angle? It’s nice to see the whole room at once! I would love to stay at the Staybridge Suites if I’m ever in Liverpool! The location is so prime, I like how you can conveniently walk from the hotel to most of Liverpool’s attractions. I can’t get over how awesome the decor of the place is as well, really feeling that Mona Lennon painting! Sounds like this place is ideal for concert-going Beatle fans! I love the fact that the fitness center is 24 hours. I can’t tell you how many times I’ve been staying in a hotel and have crazy hours…and all I want to do is run off some energy after 10pm. Awesome that this place caters 24/7! The suites look lovely! As a solo traveler I’d go for the Studio Suite. I’m a vegetarian so having the kitchen in there would make it a lot easier to keep to my diet. You never know what the food in the restaurants is cooked in nowadays, I’d bring some organic food from the supermarket. The Stay bridge suites look like a nice place to stay in Liverpool. I love how accessible everything is from the place. As a solo traveler, that is the first thing that I always look for and I am definitely going to keep this place in mind when I visit in September. Also the studio suites look quite spacious. Added to my list of preferred hotels in Liverpool. The amenities sound so good. 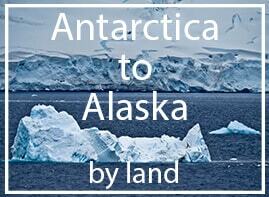 The best part is its location, it helps the touristy part of the stay. With kids in tow I have always preferred accessible hotels from sights in destination. This hotel is so convenient, making it perfect for travelers who want to sightsee! The suite looks so spacious. Having a fully equipped kitchen is a big plus! 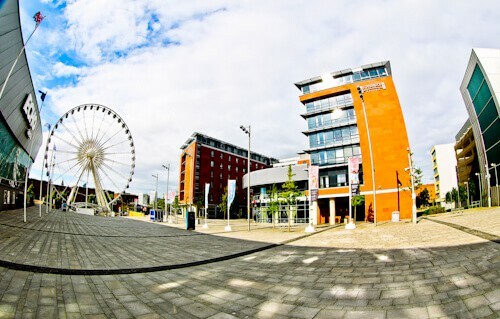 Property location is always the most important criteria for me, so it’s great to know this place is only within walking distance to the main attractions in Liverpool. The Mona Lennon sounds so interesting – I’d really love to see it. 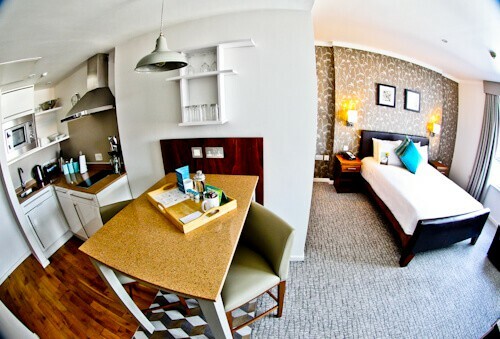 Staybridge Suites Liverpool definitely looks like an ideal choice for a trip to Liverpool! I didn’t visit Liverpool when I was in UK! The hotel looks nice! Equipped kitchen in rooms? That’s awesome. Many a times I feel like along with fridge, if a micro wave oven is available in hotel rooms it would be perfect for people like me (veggies), who end up buying food from departmental stores, rather than getting into a restaurant where food is costly and pathetic in veggie selection! Cathedral view or Dock view? That would be a difficult choice to make! Lolz.